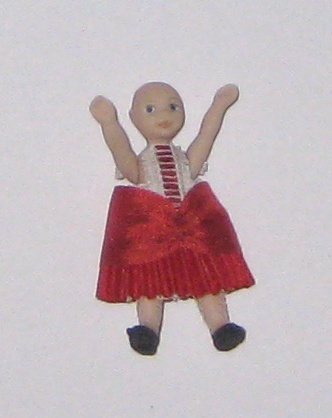 Look at this tiny, tiny doll that I made! 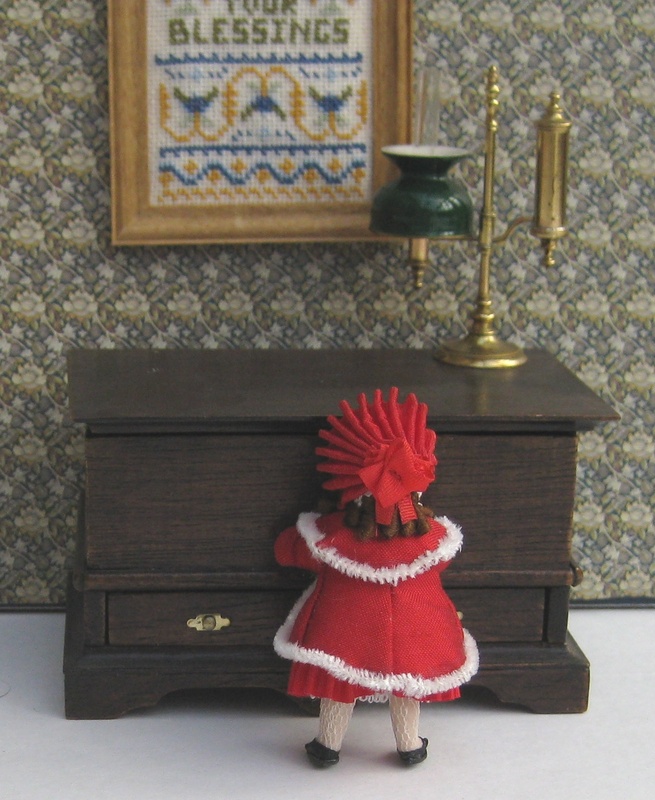 It’s a kit for a doll’s house doll’s doll, and, when it’s finished, the doll stands just an inch and three quarters high. I took some photos as I made it (sorry the quality is a bit poor – I was too keen on making the doll to check to see if the photos were coming out OK). 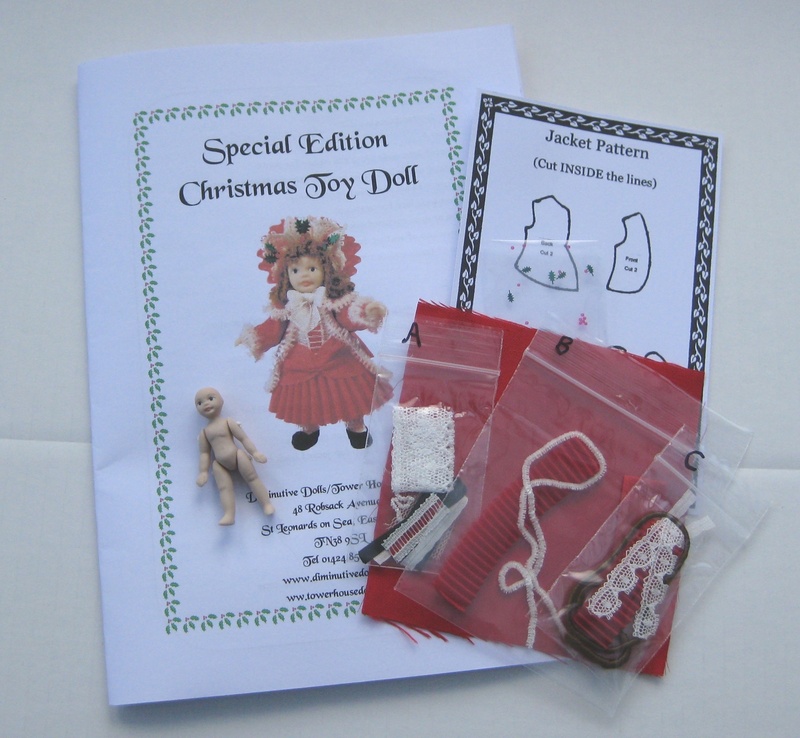 This is what you get in the kit – a 12 page booklet, a jointed porcelain doll, and several bags of tiny bits of stuff! 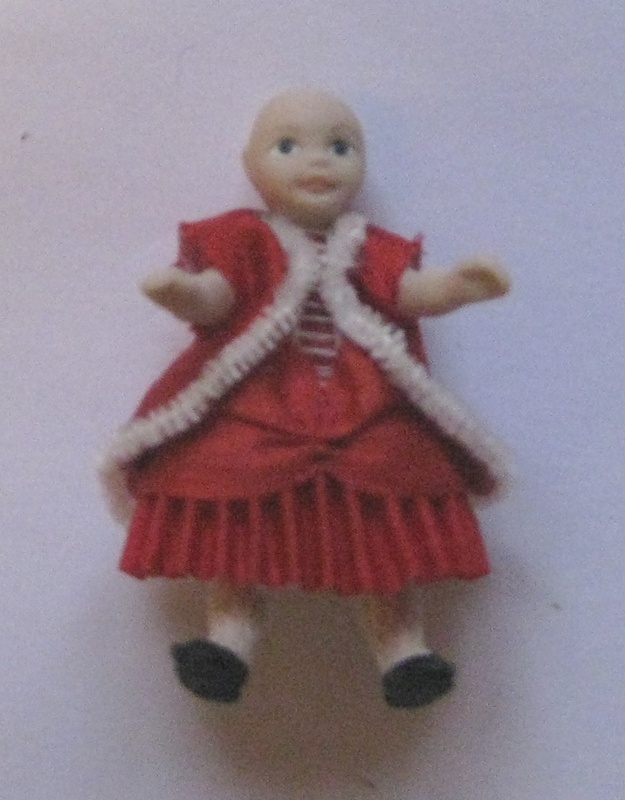 This gives you an idea of how tiny the doll is. Yup. Weeny! She looked much more attractive once I’d cut very short lengths of the viscose ringlets and ‘filled in’ the top of her head! I really enjoyed making this little doll. The instructions looked a bit daunting at first, as they’re so long, but really that’s better, beacuse it means every stage is described in detail, so you can’t very easily go wrong (unless you glue her head to your thumb, which I did at one point). I altered a couple of things (I left the ‘bustle bow’ off the back, for instance, and the cream bow that’s supposed to go under her chin – that was because I’d stuck the cape on a bit high, so there wasn’t room left to add it, really). The components were all labelled clearly in tiny plastic bags. 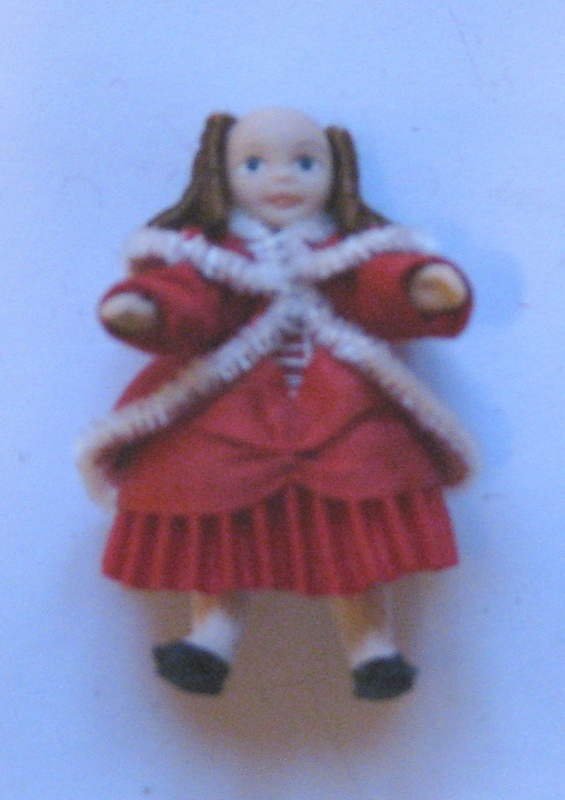 The kit was a limited edition Christmas doll by Sandra Morris of Tower House Dolls – she’s still got some for sale on her site, as well as lots of others, including bride dolls. You can buy them as kits, or ready made. I’m very tempted to get some more for the nursery in my doll’s house, now ….. 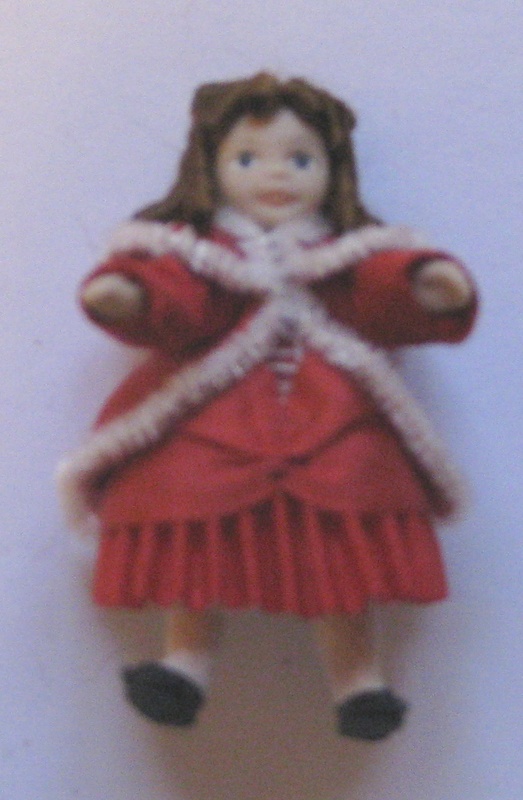 Author Janet GrangerPosted on January 18, 2011 November 6, 2015 Categories Doll's house doll's dollTags Crafts, Doll, Doll's house, Dollhouse, Dolls house doll1 Comment on Look at this tiny, tiny doll that I made!